Villa Perla, characterised by fantastic light and outstanding qualities, offers ultimate living pleasure. This villa can be built on an appropriate plot of choice on the Costa Blanca North and has the possibility of being adapted to your wishes. 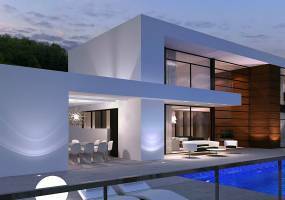 Beautiful new building design villa Model Catalina to be built on a plot of own choice on the Costa Blanca North. The villa is characterised by a clean simple modern design with frequent use of windows for a feeling of space. On the ground floor: entrance hall, guest toilet, living room, modern kitchen with appliances, utility room, bedroom with en suite bathroom with walk-in shower. Villa Arina is a designer villa to be built "off plan" with a concrete structure in a beautiful location in the famous urbanisation of Altea Hills. Altea Hills with 24-hr. security and is located just a few minutes away from the centre of Altea, the marina of Mascarat and the golf course in Sierra de Altea. The villa offers optimum privacy and a beautiful open view of the Mediterranean Sea. KEY READY! 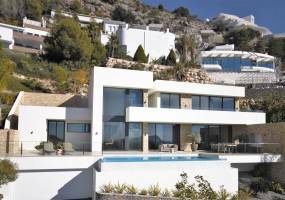 Villa Eva is one of the most spectacular key ready villas on the Costa Blanca. This brand new designer villa has a beautiful landscaped garden with Mediterranean plants and trees and is located in the renowned Altea Hills urbanisation which has 24-hour surveillance.